1. 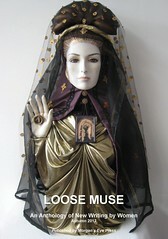 When and where is Loose Muse held? Loose Muse is always on the second Wednesday of each month (except August when there is no event), at the Poetry Café, 22 Betterton Street, London WC2 (nearest tube = Covent Garden. Each event starts at 8.00 p.m. and finishes around 10.00 p.m. Entry is £5.00 or £3.00 concessions. 2. If I want to take part in the Open Mic sessions, do I have to book a slot in advance? Not at all. As Host, I will always compile the Open Mic list on the night, on a ‘first come, first served’ basis. The floor spots are very popular, and the Loose Muse audience numbers are growing, so in the future it is likely that I will have to restrict the number of floor spots to around 10, again on a first come, first served basis. 3. How long would I get for an Open Mic floor spot? Each floor spot gets 5 minutes. This usually means there is enough time for 1 long poem, or 2 regular ones, a short short story, or a brief extract of something else. The 5 minutes includes your introduction, explanation, banter etc, and sadly if you over-run, I will have to stop you in mid-flow so everyone else gets the same chance to share. I don’t anticipate this happening very often, as readers are usually very good at not over-running. If you’re not sure how long it will take to read your piece(s) aloud, do have a practice and time them. 4. How do I get a Loose Muse feature spot? The best way is to come to a Loose Muse event and take part in the Open Mic so I can hear your work, and then put you on my long list so I can think about who it might be most interesting to match you with for a good, balanced night. Unfortunately, I’m sure you appreciate this will not automatically ensure you get a feature slot, but at the very least it will get your work noticed. 5. Can men attend and take part in the Open Mic sessions? Men are always very welcome to attend Loose Muse events – in act around 20% of our regular audience is made up of men who find the evenings interesting and informative, which is very good news. However, only women can take part in the Open Mic sessions, and we hope this will not deter men from enjoying this high quality literary event. After all, there are many other events where men can share their work, including Niall O’Sullivan’s wonderful ‘Unplugged’ at the Poetry Café every Tuesday evening. But if you’re a man, and you really want to read at Loose Muse, then you will have to wear a wig and a frock and call yourself Susan! 6. How could I be considered for publication in a Loose Muse anthology? The Loose Muse Editorial Committee is producing more formal Guidelines for Submissions, which will go on the website very soon, so watch this space. We were staggered by the number of high quality submissions we received for the first anthology, and thrilled by the great mix of poetry, stories and short plays, and really hope that this will continue to be the case for future anthologies. Until formal Guidelines are produced, the main criteria for submission remains that you have to have attended at least one Loose Muse event within the last few months. The Anthology is not open to those who have not attended Loose Muse.